It's day 18 of Blogmas and today I am sharing with you my 10 things to do before Christmas. I absolutely love the run up to Christmas, especially the week beforehand because it means I'm at home, I have finished work until January and I have also finished University and submitted my essays early so I do not have to stress and worry about them over Christmas! This means I get to relax and spend my lazy days either baking, reading, catching up on the Christmas movies which I haven't watched yet or even binge watching Netflix Series. It's a very exciting time of the year as I get to be as lazy as heck which I love! 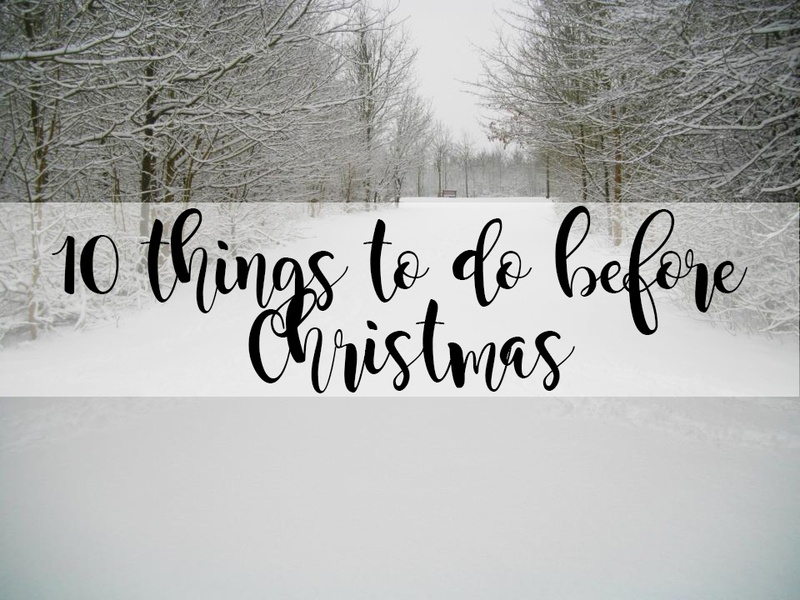 So here are my top 10 things to do before Christmas! I'm planning on making some Mince Pies in the next few days and I honestly cannot wait! I definitely prefer homemade mince pies compared to shop bought ones. 2. Wrap any presents which haven't been wrapped yet! I know I definitely do not have to worry about this one as I'm always prepared for Christmas, but I know some people who like to leave wrapping presents till Christmas Eve! 3. Watch Christmas Movies back to back! Last year I only watched about three movies so this year I'm definitely going to watch Christmas movies back to back now I have so many of them on dvd! 4. Go on a long Christmasy walk! I absolutely love long walks all year round, especially in Autumn however I also love long walks when I have to wrap up in so many layers because it's absolutely freezing outside! It's better in the evening too when all of the Christmas Lights are turned on! 5. Spend time with loved ones! As I usually do not have a lot of time, I like to spend my week off before Christmas spending time with the people who mean the most to me! 6. Prepare your "to-do" list on Christmas day for the Roast Dinner! You may know I always need to be organised which usually involves a to-do list and I always make one for Christmas Dinner to know exactly when everything needs to go in the oven and come out of the oven etc! I like to be prepared. 7. Make sure you're ready for Christmas! Have you bought all of the food ready for Christmas? Everyone's Presents? Put the tree up? If you haven't then now is the time! 8. Binge watch any Netflix Series which you haven't been able to watch. I never have time to watch Netflix so I love Christmas when I can snuggle up in blankets and just spend a day binge watching my favourite series. 9. Just relax and enjoy being at home. I really love being at home and I feel one thing I really need to do this Christmas is to relax and enjoy resting as I haven't since half term! (Even then I was stressing over my essay so I weren't exactly relaxing). 10. Make your house all pretty and festive! Light the candles, put up the tinsel and make your house look like a grotto! I know if I do this though, my dogs will run off with something! What do you plan on doing before Christmas? This felt like such a cozy post! I agree, making mince pies is definitely a must. I definitely need to be watching more christmassy movies though, but i'm doing that tonight.